(CNN) -- World No. 2 Rafael Nadal battled to victory on his return from injury at the China Open on Tuesday, but third seed Andy Roddick made an early exit. Rafael Nadal lost his No. 1 ranking this year after missing Wimbledon to have knee surgery. Top seed Nadal, who was crushed Juan Martin Del Potro in the U.S. Open semifinals last month after being hampered by an abdominal strain, was taken to three sets by wildcard Marcus Baghdatis before triumphing 6-4 3-6 6-4 in the first-round tie. The Spaniard, who has never lost a match in the Chinese capital after winning this tournament in 2005 and then the gold medal at the 2008 Olympics, needed two hours and 10 minutes to subdue the Cypriot. He won the first set with the first break of serve in the 10th game after a double-fault by former world No. 8 Baghdatis, who then broke Nadal's serve twice to level the match. Baghdatis, who slumped to 151st in the ATP Tour rankings in July before his recent rise back to 90th, had never beaten Nadal in five previous outings -- and this run continued when he lost serve in the ninth game of the decider. 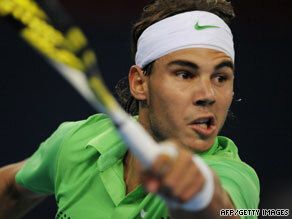 Nadal will next play American James Blake, who beat German qualifier Florian Mayer 6-3 3-6 6-3. Defending champion Roddick suffered a blow in his bid to qualify for the season-ending ATP World Tour finals in London when he was upset 6-2 6-4 by Polish qualifier Lukasz Kubot. The American third seed's renowned powerful serve let him down as he was broken five times as world No. 143 Kubot secured first victory over a top-10 player. Wimbledon finalist Roddick, who lost in the third round of his home U.S. Open, will now turn his sights to the Shanghai Masters. Kubot, who reached his first ATP Tour final this year at the inaugural Serbian Open before losing to Novak Djokovic, will next play Ivan Ljubicic. The Croatian had to battle past unseeded Frenchman Paul-Henri Mathieu, winning 7-6 (10-8) 4-6 6-1 in two hours and 17 minutes. Fourth seed Nikolay Davydenko also boosted his chances of qualifying for the tour finale by beating fellow Russian Igor Kunitsyn 6-1 6-7 (6-8) 6-2 in his opening match. Davydenko, who won the Malaysian Open last week for his third title this year, will next play unseeded German Philipp Kohlschreiber. Fifth seed Fernando Verdasco, who lost in the final in Kuala Lumpur, will next face veteran fellow Spaniard Juan Carlos Ferrero after beating unseeded American Robby Ginepri 6-7 (7-9) 6-1 6-2. French Open finalist Robin Soderling, who is also hoping to earn one of the three remaining berths in London, progressed to the second round along with seventh seed Fernando Gonzalez. The eighth-seeded Swede will next play Spain's Tommy Robredo, while Chilean Gonzalez faces Russian wildcard Marat Safin, who is retiring at the end of this season. Del Potro became the fifth player to book his place at the ATP's season-ending event when he won his first Grand Slam title in New York, joining No. 1 Roger Federer, Nadal, Andy Murray and Djokovic. However, the Argentine suffered a shock defeat in his first match since upsetting Federer at Flushing Meadows, losing to French qualifier and world No. 189 Edouard Roger-Vasselin in the first round of the Japan Open on Tuesday.